Make your own glasses case! | Hideous! Dreadful! Stinky! Happy Halloween! At the end of every spooky season I look forward to a different kind of sewing: Holiday gifts! I love when the season officially turns and it’s time to start sewing secret presents for the ones I love. In my opinion, the best handmade gift is one that will be used often. Since almost all of my family members wear glasses (even my 6-year-old son! ), I plan on making a lot of these DIY Glasses Cases this year. Read below for simple instructions on how to make your own. For the front you can use any woven fabric, leather, or faux suede. I used a linen/cotton blend by Anna Maria Horner for the front. Choose fabric with structure and body, or add interfacing to fabric that is lighter weight. For the inside I like to use something soft to protect the glasses. For these cases, I used a performance fabric by Roc-lon® called Mardi Gras 2 Roc-Suede. It’s technically a black out fabric for household use, but it’s like a faux suede and perfect for protecting glasses. The coating on the back acts like interfacing and adds structure to the cases. Interfacing: If neither your outer or inside fabric have much structure, fuse a piece of interfacing to your outer piece. 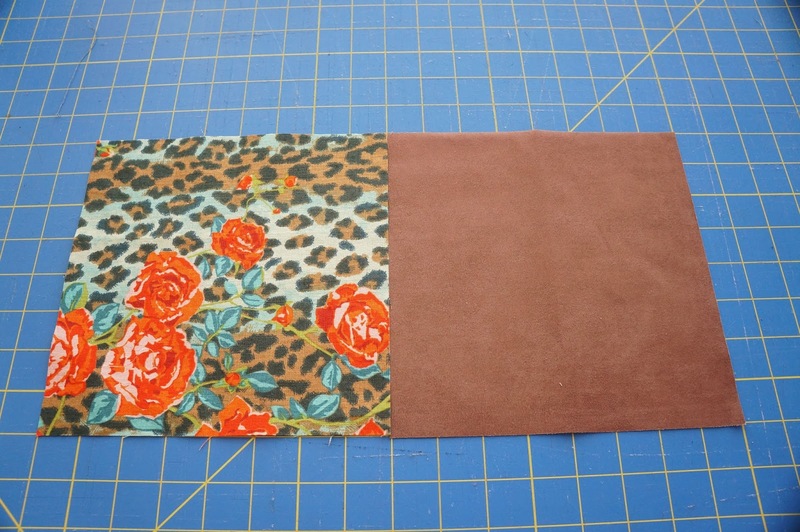 Cut your piece of interfacing 1″ smaller than the outer fabric on both the width and height. (If your outer fabric is 7.5″ by 7.5″, but the interfacing piece 6.5″ by 6.5″). Cut two pieces of fabric, one for the inside and one for the outside, measuring 7.5 inches tall by 7 inches wide. Place the two pieces together with right sides facing. Fold them together lengthwise, keeping the fold on the left side. Use a glass cup or other round object to trace a curved corner on the bottom right. (Remember, this should be on the side with the raw edge, not the folded edge). Use a sharp pair of scissors to cut along the curve. I tried using a rotary cutter for this step but it’s tricky to cut a small curve, even with a small rotary cutter. Open your pieces up and pin them together on all four sides, with right sides facing. If you are using leather, which shifts A LOT under the sewing machine presser foot, use these clips to hold the layers in place. Don’t use pins in leather, because they will leave visible punctures in the leather. Sew around your fabric on all four sides with a 1/2″ seam allowance. Leave a 3″ gap along the top so you can turn your fabric right side out. As you can see below, the curves are difficult to sew neatly. Go slow and keep your eye on the edge of your fabric, rather than the needle. If your corners get wonky (like mine! ), go back over them with the sewing machine and even out the curve. My corners looked much better when I went back and fixed them. For a cleaner curve, you can also trace the corner with a pencil or pen and use the line as a guide for your stitches. Again, make sure you left a 3″ gap in the top edge so you can turn the fabric right side out after the next step. (As you can tell by my photo, I forgot to sew along the top edge originally, and had to go back and add this seam. Oops! Do as I say and not as I do). Trim your seam allowances to 1/4″ along all four sides, being very careful not to cut into any stitches. Clip the rounded corners. This will make the curve smooth when you turn it right side out and press. Pull the fabric right side out through the opening. Tuck the opening under 1/4″ and press well on all four sides. Make sure the rounded edges are nicely pressed. Pin the opening closed along the top edge, making sure the seam allowance is pressed under and even 1/4″. Top stitch along the top edge, starting at one corner and backstitching at the other end. Your stitches should be about 1/16 from the edge. This will secure the opening closed and add a nice finishing touch to your glasses case. Fold your glasses case so that the outer fabric faces out. Carefully match the curved edges and pin well. Back at the sewing machine, stitch the side and bottom edge 1/8″ from the edge. Then go back and add a second row of stitches 1/16″ from the edge. This will give you two nice rows of topstitching and add strength to the seam. Tada: a beautiful glasses case for your own use, or for a friend! These come together in about 15 minutes, which means they are great last-minute gifts for birthdays or Christmas. Throw them in stockings, hang them on the tree, or fill them with candy and use them as holiday dinner favors. Imagine the possibilities! The case pictured below features Roc-Lon faux suede on the outside and quilting cotton on the inside, a reverse of the case I made for this tutorial. The possibilities are endless! I’d love to see what you come up with. Thank you so much for reading, and Happy Sewing! This post was brought to you by Caila!